This is a "must have" for all straight razor shavers. A strop helps maintain a fine cutting edge on a straight razor and should be used regularly. The Two-Sided Prima Rindleder Strop combines premium quality leather on one side with canvas on the reverse. The canvas side produces the same effect as a light honing and extends the period between honings. It features a nickel plated swivel loop for hanging. It's a beautiful strop and it comes ready to use. Use #186 Strop Paste to keep the leather soft and supple. 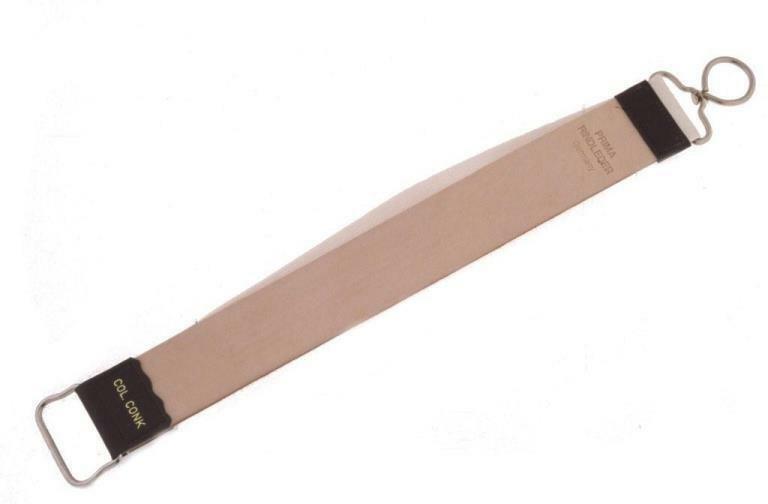 Leather stropping length: 11 7/8"
Canvas stropping length: 13 1/2"